Imagine if we had no Yellowstone or its iconic Old Faithful geyser and American bison, no Statue of Liberty or its history, no Grand Canyon that was carved into the red rock by the Colorado River. The national parks have helped ensure these special places will still be there for future generations to enjoy. That is what national marine sanctuaries do for special places that are underwater. Sanctuaries help preserve and protect iconic coral reefs, protect nursery habitat essential for many fish and other marine life, preserve historic and culturally-important sites that are part of this nation’s history, and more. 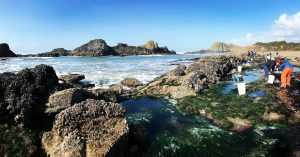 National marine sanctuaries help ensure that we will be able to enjoy these special places for generations to come and that we can continue to use these resources in a sustainable manner. How do you help protect the ocean? I make sure to make sustainable seafood decisions. When buying any seafood, I make sure they were caught sustainably by either buying locally and asking the fishermen how they caught it (this of course requires a bit of research on what are sustainable fishing practices), or you can check through Monterey Bay Aquarium’s Seafood Watch list or look for certified sustainable seafood by the Marine Stewardship Council. I also make sure to try and recycle everything, and use least amount of plastics possible. For example I never buy disposable single-use plastic water bottles and always carry my refillable, reusable stainless steel water bottle. In my family we also use small mason jars and re-fill them with juice instead of buying juice boxes that also create a lot of waste, and have a few stainless steel straws at home which we use instead of plastic ones. We always use paper bags or reusable bags when going to the grocery store. It has been well documented that many marine life die because of ingesting plastic materials, such as plastic straws or plastic bags. Beach clean-ups and dive clean-ups are also a great way I like to help out ocean. Every piece of plastic or other marine debris removed from our beaches and ocean make a huge difference. We are now learning about the effects of microplastics on our ocean, and just picking up one single-use plastic water bottle (which eventually breaks into thousands of microplastic pieces) can make a huge difference! Anyone can help pick up a few pieces of trash anytime they visit the beach. How does your heritage inform your experience in the outdoors? I grew up in Ecuador surrounded by amazing marine and aquatic ecosystems. Since I was quite young, I was drawn to the Galapagos Islands and the Amazon region. Being part of this vast and unique biodiversity gave me an unbounded curiosity and enthusiasm for nature, for animals, and for our water resources. I saw their inherent beauty, and early on recognized what an important resource our waterways were to all living things and how much we owed them in return. At a young age, I also realized that there were issues troubling our ocean, and it was then that I made it my goal to dedicate my life to finding ways to protect them. When I was little, my mom would take me to the beach in Ecuador, and I remember always going to the fishermen’s boats as they would come in early in the morning after spending all night fishing and looking at all the fish they caught and being fascinated by all the unique life that lived just beneath the surface. My whole life since I was little I always thought of myself as a mermaid, mean to live life in the ocean, beneath the waves. The first time I dived into the deep blue I could not see the bottom. I was in a very special marine protected area off the coast of Ecuador called Machalilla, Isla de la Plata. My heart started racing with a mixture of excitement, curiosity, and a slight fear of the unknown. As I slowly started to descend I began to see the wondrous life that surrounded me; I could hear the fish pecking at algae on the reef, I saw a wall of fish dance and change forms as other fish swam around them. A baby sea lion playfully came close to me, blew bubbles in my face, and ran off to bring back its toy piece of algae. I felt like my heart skipped a beat, that moment I knew that is where I was meant to be, I have to come back as often as possible to visit the most beautiful places on Earth. Although I began scuba diving later in life, I was able then to observe our impact on coral reefs and other marine habitats, and how we have decimated so much of our marine life. As I have grown, I have learned that marine ecosystems and the fisheries they support are some of our most priceless legacies, but if not handled properly they may soon be irreparably damaged. I cannot remember ever having a different life goal than to dedicate myself to preserving these special places. As an optimist, I believe that change is possible and this is my motivation. 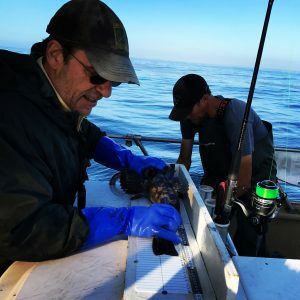 It is a common misconception that conservationists, scientists, and fishermen must forever be embattled over “to fish or not to fish.” Rather I believe that we have a common goal: to ensure best practices so that this source of livelihood and cultural heritage does not decline over time, and that our descendants may enjoy and benefit from it too. It is possible to have both a healthy ecosystem and a prosperous economy. What is your favorite way to enjoy the ocean and Great Lakes? When I was little I loved to go tide-pooling and see all the cool little critters that make the rocky shoreline their home. I also love bodyboarding and hope to learn how to surf. It wasn’t until recently that I was able to experience the joy of diving. Diving has given me the opportunity to become a mermaid and to interact with the most amazing marine life. 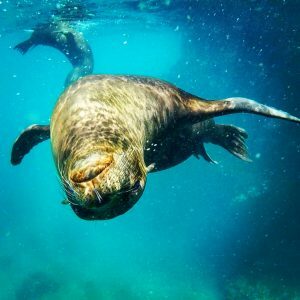 I have had the opportunity to go diving with sea lions and sharks in the Galapagos, dolphins and manta rays in Hawai‘i, and I hope to be able to go diving in kelp forests off the Oregon and Washington coastlines and see the rockfish that I am studying first-hand in their natural environment. The importance of outreach and good science communication skills and why I love this aspect of my job! Doing research is an essential part of the scientific process. In the scientific community, the epitome of valid research is having it published in a peer-review journal. Unfortunately, this is as far as many scientists go. But what about sharing your research with local communities, i.e., non-scientific audiences, that might be impacted by this research? What about connecting your research to a bigger picture? For the public to be able to make intelligent decisions in many areas–how to allocate the communities’ budget, what fish to eat, personal choices on use of plastic and other trash—they must be able to understand what is at stake. However, many in the scientific community have spent decades seemingly separating themselves from the non-scientific community. Scientists use a whole different vocabulary than the average person in an attempt to explain natural phenomena. They use complex statistical analyses to prove their theories, and some may even pride themselves in knowing what is best for the disadvantaged communities that are in need of a scientist’s help. But this is where we have gone wrong. As scientists, we have at times alienated ourselves into a bubble, stopped listening to others without fancy degrees, or have acted arrogantly towards those outside of the scientific community. Furthermore, many scientists find themselves embattled in the publish or perish dilemma, and may not see it as part of their job or even understand the importance of sharing their research outside of the scientific community. Before I started my PhD at Oregon State, I was unaware of the importance of outreach and good science communication. 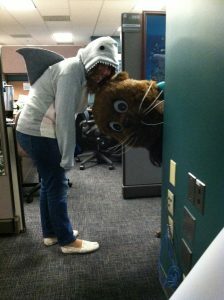 It was at a NOAA internship at the Office of National Marine Sanctuaries in the Education, Outreach and New Media Division, where I learned what outreach was and its importance. 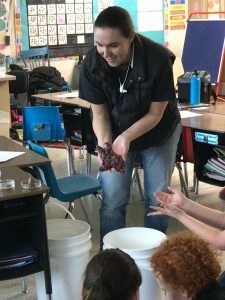 Outreach gave me an opportunity to share my love and passion for the ocean and tell audiences why sea critters are so cool and why ocean resources are worth protecting and why I was so much in love with the work I was doing. In this manner, I also learned to love outreach. 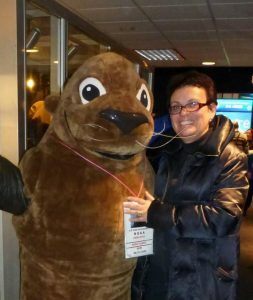 Yes, this is me dressed up as Sanctuary Sam, the official Mascot for NOAA’s Office of National Marine Sanctuaries, as part of NOAA’s open house day in Silver Spring MD. 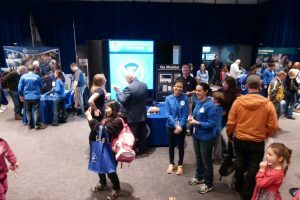 NOAA’s yearly community outreach event. I got to help out and tell the communities about Marine Protected Areas, like National Marine Sanctuaries, and why they are important for Ocean conservation. Once at Oregon State, I took my first science communication class with COMPASS. After addressing the American Association for the Advancement of Science (AAAS) with a call for a “New Social Contract with Science”, Dr. Jane Lubchenco and other like-minded scientists founded COMPASS on the “premise that ocean scientists, in particular, had a wealth of knowledge that was not reflected in public understanding or policy and management practices.” (Lubchenco 1998; Smith et al. 2013). In this class, students are encouraged to use a tool they developed called a message box to hone in on their main message, get rid of the jargon and tell their story (develop story-telling skills). I learned that while I may find my research to be absolutely fascinating, other people might find it more interesting if I tell them my story. In telling my story, I can also tell them about my research. Developing these story-telling skills is crucial for humanizing scientists and making our research more relatable. If you have ever been to a lecture in college or school, in which the professor drones on and on in a monotone voice on some obscure topic using vocabulary and examples that no one else but him seems to understand, then you have witnessed bad science communication. The difference with a teacher or professor with good science communication skills, is that you fell connected to the topic being discussed and want to learn more. The scientist or professor does not bog you down with jargon or all the nitty gritty details of the research. Rather the scientist or professor may tell you a story related to their research, or take you on a journey that gets the class intrigued on the subject. This skill is the hardest one to develop. Letting go of this jargon and the nitty gritty details of our research may at first seem impossible. As scientists, we are trained to be very cautious in the conclusion we read and specific in the language we use. However, when we communicate our science to general audiences we must learn to forgo that and get the main point across. 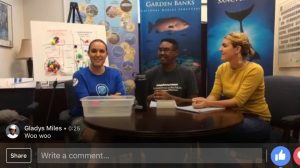 Doing outreach through Facebook live hosted by NOAA’s ONMS. A great tool to share and explain our research to broader audiences. Having good science communication skills does not only mean being able to express yourself and explain your research eloquently, but having good listening skills as well. Too many times, scientists have alienated the communities which they wish to help or work with, by not listening to them. Going into a community with open ears and hearing what their concerns and research needs are and how you can help has been shown to result in much more successful collaboration, than going into a community with a mindset that I, the outsider scientist, know what is in the best research interest for you, the lay people. Local knowledge and wisdom have too often been ignored by many scientists, when they should be complimentary/collaborative to our research. 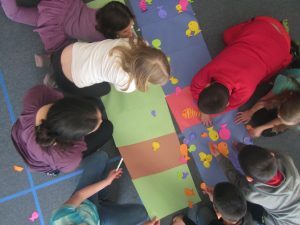 Combining outreach with good science communication skills can help scientists connect their research with communities that may be affected differently, get public support for their work, inform policy to make the best science-based decisions, increase collaboration opportunities, inspire a next generation of scientists, make a difference, and possibly even get more funding for this research. 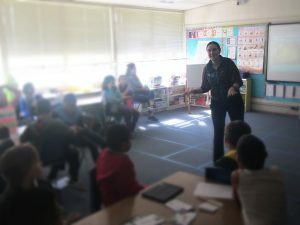 Personally, I particularly love going to schools and telling kids about the ocean, seeing their face light up with fascination as I show them pictures of odd and beautiful sea creatures and answering their questions about the sea. I love answering questions from my friends about how to make smart choices when it comes to sustainable fisheries and about the health of our oceans’ marine resources. I love it when a stranger on a plane asks me what I do, and I get to tell them about all about some of the cool things I get to do for my research, like going fishing. My goal in life is to make a difference in conservation of ocean resources and ensure sustainable fishing practices so that we can continue to fish for generations to come. 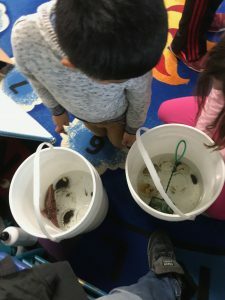 I hope that through the outreach work I do and the improved science communication skills I have acquired, I can inspire others to take care of our oceans whether by taking small steps such as helping in local cleanups or using less plastic, or by one day becoming scientists in this fascinating field. Lubchenco, J. 1998. Entering the Century of the Environment: A New Social Contract for Science. Science 279(5350):491–497. American Association for the Advancement of Science. Smith, B., N. Baron, C. English, H. Galindo, E. Goldman, K. McLeod, M. Miner, and E. Neeley. 2013. COMPASS: Navigating the Rules of Scientific Engagement. PLoS Biology 11(4):e1001552. Public Library of Science. Every day I get to go out on the Ocean I feel like the luckiest person in the world! I was in Portland OR, attending the Ecological Society of America (ESA) meeting, when I first heard the good news that I had gotten the Malouf Marine Studies Scholarship! I could not believe it, and was so exited. I ran all over the Oregon Convention Center, trying to find my adviser to tell him the good news! I finally had the funding to start doing field work and begin my PhD research. 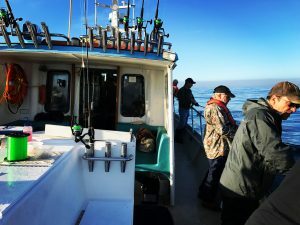 During September I had my first chance to go out with Oregon Department of Fish and Wildlife (ODFW) Marine Reserves Team, and learn how their Hook and Line survey methods works. A method I plan to use as part of my research. I learned so much those few days I was out there with ODFW’s David Wagman (also known as Wolfe, bottom left). He is a really good mentor and gave me great suggestions on how to improve my proposed research. Unfortunately that was the last outing of the season. I need to finish writing all my permit application in the winter in order to be ready to hit the ground running next year. 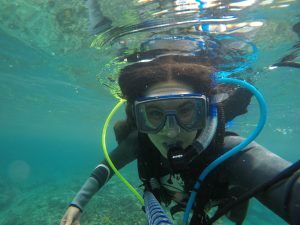 NOAA scholarships have given me the opportunities I would have never even dream possible. 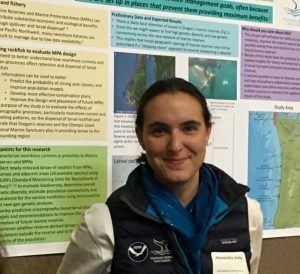 Just like Oregon Sea Grant is part of NOAA Sea Grant College program , so is another scholarship that has greatly impacted my life, the Dr. Nancy Foster Scholarship, from NOAA’s Office of National Marine Sanctuaries. 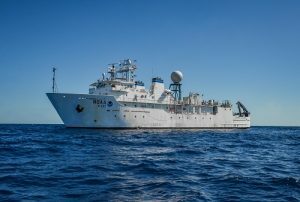 I’m currently serving aboard the NOAA ship Okeanos in the Gulf of Mexico, as part of a program collaboration opportunity that was given to me as a Dr. Nancy Foster scholar. I’m here to serve as in data logging and samples processing. At the end of the expedition I will be writing a report that will help prioritize data for researchers, ensuring that the data can be efficiently used. The NOAA Ship Okeanos Explorer expedition is running from November 29 through December 21 2017, and is investigating deep-sea habitats and the associated marine communities in the Gulf of Mexico basin. 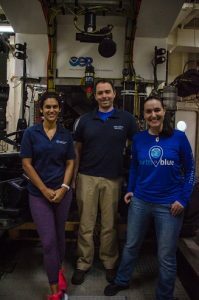 Through the Okeanos expedition, other researchers and I, are exploring and discovering vulnerable marine habitats and investigating areas relevant to resource managers, submerged cultural heritage sites, and marine protected areas. 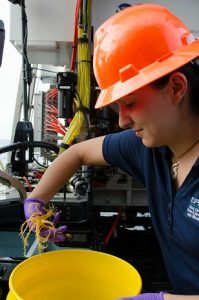 Okeanos is equipped with telepresence, meaning people on shore – whether scientists or the general public – and anyone can watch the remotely operated vehicle (ROVs) dives live in real time (click here to stream video). 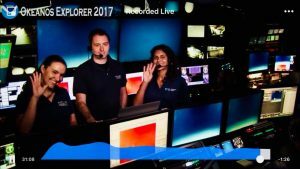 In fact, next week, we will be conducting a Facebook Live event from the NOAA Ship Okeanos Explorer in the Gulf of Mexico this Tuesday, December 12th 2017 at 11:00 am PST (2:00 pm EST). Science Co-lead Dr. Diva Amon, Expedition Coordinator Brian Kennedy, and I will be there to answer everyone questions! Check out Diva’s, NOAA’s OER and my twitter profiles for daily updates from the Okeanos!